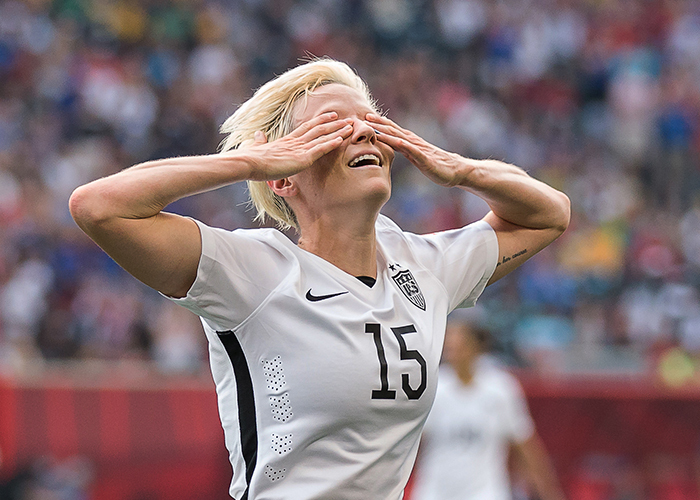 USA midfielder Megan Rapinoe celebrates after scoring a goal against Australia during the Woman's World Cup match at Winnipeg Stadium June, 8, 2015. Although many of the elements of shooting a sporting event are generic the Men’s and Women’s World Cup present special challenges for the sports photographer. The Men’s World Cup is the biggest sporting event in the world and more importantly, I was there. Well almost, when I picked up my credentials in Rio de Janeiro they didn’t have my parking pass for the opener in Sao Paolo. No problem, up at 5AM, five-hour drive to Sao Paolo you can park next door and get it then drive in. Now in Sao Paolo, stopped at a roadblock two miles from the stadium, ninety degrees out and I couldn’t get through it without a parking pass. My driver didn’t speak a word of English. Finally got him to park while I walked the distance to get the parking pass and get back to the car. Missed the opening ceremonies, but here I was at the biggest sporting event in the world. If I could never shoot an event again, it would have been OK, what could be better than the World Cup? It is estimated that in 2014 one billion people watched the finals between Germany and Argentina. Attendance for all of the matches in Brazil reached 3.5 million people at twelve sites. The Women’s World Cup began in 1991 and although it has been less well attended and viewed, it’s popularity and attendance is gaining rapidly. The proximity of the six sites in Canada to the U.S. and the achievements of the U.S. Women’s Team meant that it was very popular with U.S. fans who made every U.S. game feel like a home game for the U.S. team. After covering the men’s tournament in Brazil, I had the opportunity to cover the Women World Cup tournament in Canada for isiphotos.com, the photographic company for U.S. Soccer. The women’s tournament was expanded from 16 teams in 2011 to 24 teams playing at six sites in 2015. Total attendance was almost 1.4 million fans for 52 matches. Having attended my first international match in Rome, Italy in 1966 the opportunity to cover both the Men’s and Women’s World Cup was a truly special thrill for me. We are all used to sending for credentials, but credentialing for the world cup is different, from other events. The initial credential obtained far in advance simply allows you to apply for specific game credentials. These are granted only days before the event. You cannot apply for game credentials beyond the first round as the granting of these credentials depends on which teams advance and your relationship to them (e.g. whether your agency is from the same country as the teams that are playing). After you are approved for a specific game you are assigned a group to get your seating around the pitch or in the tribune. Although it doesn’t sound great, some of the most memorable shots from the men’s tournament were obtained from the tribune. Your group is assigned based on country and agency and your order of selecting is based on when you arrive at the venue. Once you are assigned your seat, you are allowed to go to the field 1.5-2 hours prior to the match. When the match starts, standing or other movement are not allowed unless you work a trade or there is an empty seat at halftime. The seats are folding chairs, which are inches apart making it tough to shoot and your neighbor’s lens hood becomes a potential obstruction for shots down the line. The good news is that you have a power strip and have hard-wired Internet access at every seat a huge benefit in the era of live feeds. For the games in Canada prior to the finals, there were only eighty seats around the pitch. This was increased to 120 for the finals, but all knew, particularly given the presence of the U.S. team that there would be a lot of photographers. The media center opened at 10 AM for a 4PM game. In spite of this, I arrived at about 9 AM, which made me the sixth person in line in Group 2. When I arrived, there were already a lot of fans there. Group 1 was reserved for agencies like the Associated Press and Getty. Seat selection is always a gamble in any sport but my favorite for soccer is the sideline as close to midfield as possible. This had been a perfect spot to shoot Abby Wamback after her goal in the Nigeria game. It also allows the best angle for shooting the goalkeeper. For the Men’s World Cup the seats extended to about 40 yards out from the endline, too far out for me. I prefer to be 15-20 yards from the endline. The last seat for the finals of the Women’s World Cup was within that range. The first order of business on arriving on the pitch is goal remotes. FIFA outlines an area where we may put remotes and it is a small area. The mid-point of the goal is occupied by a large microphone, which for one match was moved to a point right next to my camera, blocking my field of view. In Brazil, FIFA asked us to use mirror lock to decrease noise…. we all laughed. 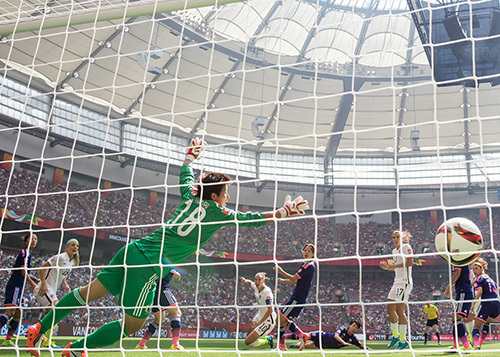 The Woman's World Cup Finals, USA vs Japan, match at BC Place, July 5, 2015. Final score, USA 5, Japan 2. Unfortunately, none of this setup matters if your equipment is moved or people set things up that obstruct your field of view. I had problems during a few matches with a change in the position of my camera after I had set it up. In spite of concerns that there would be too much radio frequency interference, my PocketWizard MultiMAXes did a fine job of triggering my remote cameras. I prefer a foot pedal (by Michael Bass Designs) to trigger them as opposed to mounting the transmitter on-camera or an on-lens trigger. For the finals, I attached a bracket to the back of my chair with an extendable pole and a bracket for two PocketWizards which put them at a height of about five feet designed to optimize my signal. In Brazil, the security of our gear was a significant issue for all photographers. One of my first experiences at the Men’s World Cup was hearing about an AP photographer who had his Canon 1DX and 400mm 2.8 lens stolen during a game. This was an ongoing issue in Brazil and there were rumors that people with forged photographic credentials were doing the stealing. Thankfully, in Canada this did not appear to be an issue. As all who shoot soccer know, it is virtually impossible to keep track of all of your equipment every minute prior to and after the match when you are doing shots of players and fans. One major difference between the Men’s and the Women’s World Cup was the fact that in the opening round, many of the games were doubleheaders. You arrive at the match four hours in advance, shoot two matches that last two hours each. One hour between matches and editing time results in days that last more than 12 hours. That’s of course a long day. But the good news was that in spite of the schedules, I was able to shoot nine matches in two weeks during the opening round. Three of the venues were in Eastern Canada and three of the venues were in Western Canada. Since I shoot for the agency that works for U.S. Soccer, I really wanted to be at the venues where I could shoot the U.S. team. So even though I live on the East Coast, I started in Edmonton where I would be able to shoot the World Cup opener and moved to Winnipeg where I was able to shoot two of the U.S. matches. At the end of the 2 weeks, I shot two matches in Winnipeg and then early the next morning flew to Vancouver to shoot the U.S. match against Nigeria later that day. The Nigeria match was a fantastic event as the U.S. victory guaranteed movement to the next round and the plethora of US fans continued to make the team feel like it was playing at home in the U.S.A. In my relatively short photographic career, I would rate the experiences I have had at both World Cups among the best of my life there is a reason that the world views these events as the greatest in the world! Of course, having our national team win the tournament added to the experience in a way that will be hard to exceed.